Floralie captures the joie de vivre of today's modern sophisticates. This ethereal, fresh floral fragrance pays tribute to flowers as art. Florals are truly the heart of perfumery and there is nothing more luxurious than indulging in fresh flowers at home or even in a boutique. 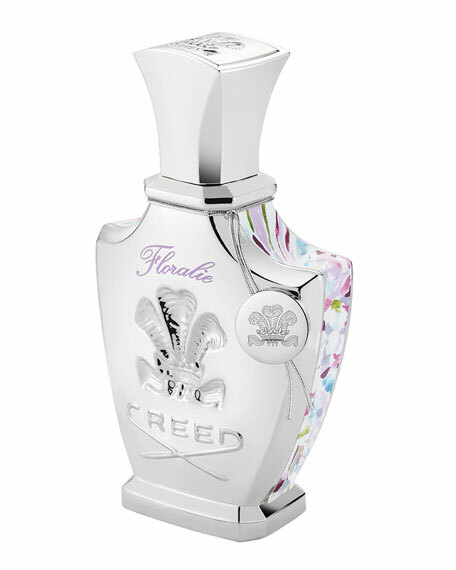 Floralie brings that indulgent feminine experience to a woman's boudoir and is a testament to the craftsmanship of the fragrance creation process a work of art itself. Much like a painting or sculpture, the process and ingredients that go into creation is an art form. Olivier Creed describes it as, "Smelling a fragrance you love changes the way you feel, just as seeing a beloved painting or sculpture can deeply impact you. As a creator, I never stop working on a scent until I feel it is complete. While technically there is scientific know-how required to create a winning juice, at the end of the day, without the artistry of the creation process, it would just be science. Artistry is the key ingredient. Founded in 1760 and passed from father to son, Creed is the world's only privately held luxury fragrance dynasty. Based in Paris, the company today is led by Olivier Creed, a sixth-generation master perfumer. Creed is famous for unrelenting high standards when it comes to fragrance creation.. Mr. Creed travels the globe searching for the purest essences to compose his masterpieces. Using the infusion technique (which has been abandoned by the modern industry), Creed weighs, mixes, macerates, and filters everything by hand. They also use the highest percentage of natural components in the prestigious French perfume industry. For in-store inquiries, use sku #2710805.